Discounted Tickets Available - Click Button Above to Purchase. Films Under the Stars and much more! An EPIC weekend of ADVENTURE into Science of UFOs & Extraterrestrial Life, Ancient Aliens, Human Origins, Crop Circles, Government Disclosure, UFO Sightings, Forbidden Archaeology, Contact Experiences and the “need to know”. CONTACT in the DESERT holds its 7th Annual event at the Renaissance Resort and Hotel in Indian Wells, California. 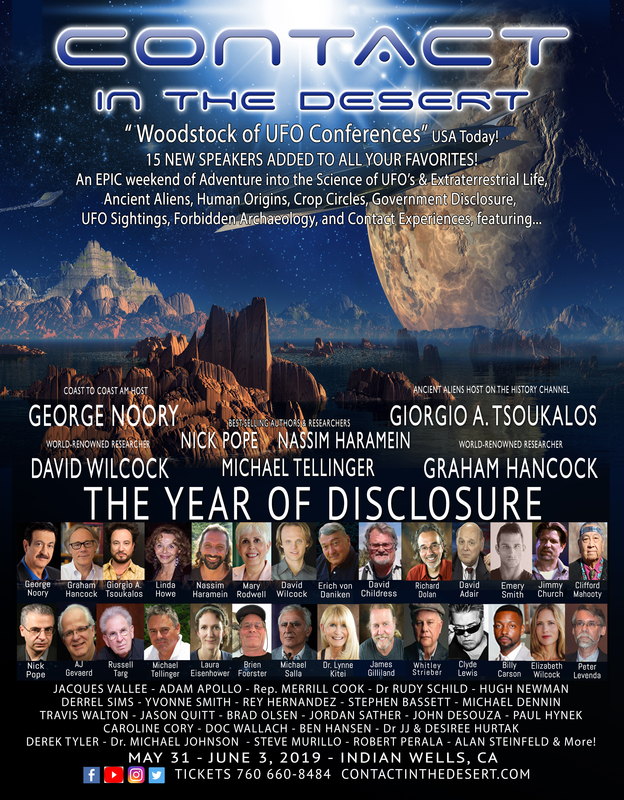 CONTACT in the DESERT will bring together an all-star team of experts to discuss the latest developments in the field, including updates on Antartica , the worldwide rise in abductions and more! CITD 2019 is more than a conference. It is an EPIC event, a portal through which attendees can gain knowledge and the most up-to-date info on UFOs and ancient alien studies. Giorgio A. Tsoukalos, Graham Hancock, David Wilcock, Nassim Haramein, Linda Moulton Howe, Erich von Daniken, David Adair, Emery Smith, Michael Tellinger, Michael Salla, Richard Dolan, Russell Targ, Nick Pope, David Childress, Peter Levenda, Derrel Sims, Dr. Jacques Valleé, Adam Apollo, Jason Quitt, Mary Rodwell, Rep. Merrill Cook, A.J. Gevaerd, Jimmy Church, Clyde Lewis, Laura Eisenhower, Rey Hernandez, Brien Foerster, Dr. Rudy Schild, Dr. Michael Dennin, James Gilliland, Whitley Strieber, Hugh Newman, Maria Wheatley, Stephen Bassett, Travis Walton, Terry Lovelace, Bill Homann & Carole Davis, Clifford Mahooty, Yvonne Smith, Billy Carson, John DeSouza, Dr. Lynne Kitei, Paul Hynek, Doc Wallach, Adam Curry, Elizabeth Wilcock, Derek Tyler, Barbara Lindsey, Eric Rankin, JJ & Desiree Hurtak, Ben Hansen, Jordan Sather, Michael Johnson, Steve Murillo, Robert Perala, Alan Steinfeld, Brad Olsen, And Many More TBD!! !